Earlier this year, I was hoping that I would have bought my house by now, so that I could have a real garden in the actual dirt this year. But it took me longer than anticipated to get paperwork stuff in order, and then everything I've looked at so far has either been a Scary Mold House of Doom and Woe, or somebody else snatched it up before I had a chance to put in an offer. So no house yet, which means it's another container garden on the back steps for me again this year. I haven't had a super lot of luck with container gardening in the past. My herbs and flowers usually do pretty well, and my potatoes did well last year, but my greens have a tendency to either wilt or get leggy and bolt, and fruiting stuff never puts out much fruit, or the squirrels eat it before I get a chance to (although I've had some luck keeping them off with Liquid Fence). 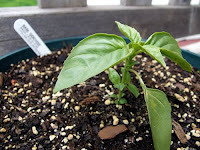 All the same, this year so far I have planted the following: tomatoes (one Early Girl and two Sun Gold), cucumber (first time I've tried it in a container), Russet potatoes, basil, parsley, dill, rosemary, dahlias, calla lilies, and a fuchsia. I also have some sickly cayenne pepper plants that I got for free, that I think I'll be able to nurse back to health. I'd like to think that the squirrels won't eat cayenne. What else should I grow? What does well in containers? I have one 6" by 28" planter, two 12" diameter pots, and a bunch of smaller (3" to 8" diameter) pots without anything in 'em yet. I was thinking about putting some lettuce or salad greens in the longer planter, but it seems like it's somehow too "late" for lettuce, even though we've just barely passed the local frost-free date, and anyway I'm afraid they'd just wilt dead, like my lettuces of the past. I could just fill up the pots with more herbs--oregano, chamomile, peppermint. Maybe I'll grow another pot of basil. One can never have too much basil.